What would your ideal funeral be like? Have you given any thought to what you'd like to happen to you after you die? In each chapter, Caitlin takes us to a different country and examines their culture and attitude to deathcare and funereal arrangements. 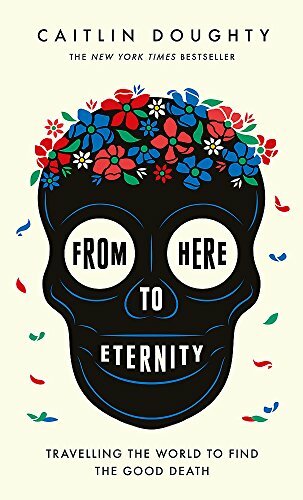 She visits decomposing bodies that return to the ground in the most natural way possible, mummified relatives that still live in the family home, and a collection of wish-granting Bolivian skulls. Along the way we get a fascinating glimpse into green burials, body composting, viking-style funeral pyres and a hi-tech Japanese (where else) method of visiting your deceased loved ones. Caitlin is the founding member of the Order of the Good Death which aims to get people to think about their own mortality and what they would like to happen to them once they pass away. If you have a clear death plan (and more importantly, have made your family aware of your wishes in advance) it takes a lot of the burden from your loved ones at a very difficult time. Reading this book can give you some ideas you may like to explore and investigate if it is possible in your country. Although I also own the hardback book, I listened to the audio version narrated by the author.